Serving others is what it's all about in life for Leslie Wolgamott and also what she attributes to her success - and happiness. 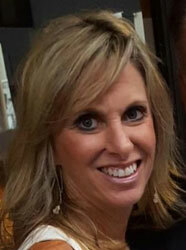 An IBO for 29 years, Leslie says, "I am committed to this Business and all IBOs involved in this wonderful opportunity. Serving others is my passion. It's how I have achieved Double Diamond with the support of my family, and why I believe I would be an asset to the IBOAI Board." Helping people create confidence and belief in themselves through this Business has been Leslie's greatest reward. She tells new IBOs, "This is a great opportunity for you to help others create financial freedom, which in turn, allows you to be blessed in every area of your life. I've learned over the years - your greatest fears will become your greatest strengths. Never give up! This journey is so fulfilling." Gratitude is part of Leslie's daily life - she is thankful for God, her four beautiful children, and amazing husband, Jeff. Honored by her nomination to the IBOAI Board, Leslie remarks, "I have been inspired by the incredible IBO Leaders who serve on the Board, and would welcome the chance to serve on the Board and be a part of such a wonderful team!"